Holy scheduling conflicts, batman! I haven't blogged in more than two weeks!! People have been asking me if I'm ok, just because they haven't seen a post lately. Yes, I'm a-ok, just busier than all get out. I feel like I haven't had time to stop or breathe or anything for the last few weeks. Last weekend, Matt was a groomsman in his best friend's wedding (love you Wevin!). It was such a beautiful and fun day! Then this weekend, one of my good friends Paige, who I have known since I was about 5, got married, and I got the privilege of being a Scripture reader. So those two things, on top of just life and work and everything else, have kept me soooo busy. But I haven't forgotten about you! 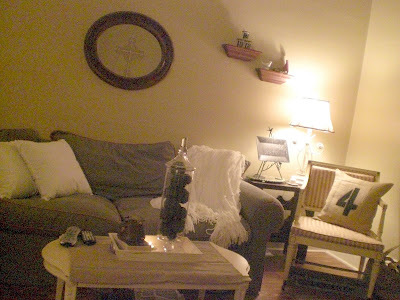 I managed to snap a few shots of my living room for you last week when we had a little girls' night for Paige. She's Lebanese, and we've always joked that her wedding would be just like the movie My Big Fat Greek Wedding. So of course we had to watch it a few days before the big day. I hosted the bride and a couple of our high school friends for the evening, and thought it was a good opportunity take some pictures of my living room. I'd like to show you complete shots of all the rooms in my apartment before I move out in a month and a half, so look for more coming soon. Ok, so not my living room, but here is the yummy part of the evening, some of our favorite girly wine in pretty (Dollar Tree) wine glasses. I used some of my flea market numbers as wine glass markers. I just tied them on with jute. I LOVE the gray wire cloche on this table, and want the matching larger one at some point. Right now it houses my lavender seedlings, which are just peeking through the dirt. You can't see it well in this picture, but I used one of my zinc placecards as a label for the lavender. Looking at the room from the hallway toward the front door. I want to paint them chippy white and gray, with a linen or light-colored cotton upholstery. 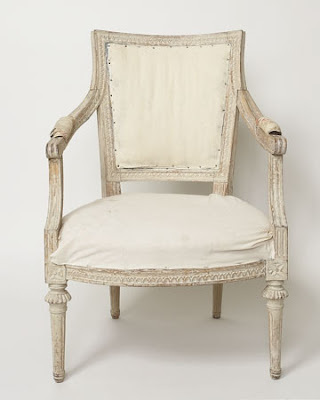 Very Gustavian. Looking into the hallway/bathroom (sorry about the toilet shot) from over by the window. Well there you have it! 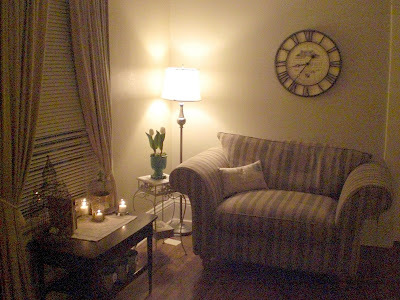 My teeny tiny living room. I've loved living here but I'm excited to be able to live in a bigger place. Well, ok technically I will be living in my parents' house for several months, but after that I will hopefully have a much larger, but still character-filled, home. I hope you enjoyed the tour! Stay tuned for more room tours! I love your couch! It looks so warm and comfy! Mira said....Glad you okay...missed seeing your ideas. I'm thinking of borrowing that cross while you're home for the entry.....bwahahaha!!! Also, you are a beautiful groomsman's girlfriend/scripture reader! I am truly blessed!